Rapidly rising atmospheric CO2 concentrations are driving acidification in parallel with warming of the oceans. Future ocean acidification scenarios have the potential to impact coral growth and associated reef function, although reports suggest such affects could be reduced in adjacent seagrass habitats as a result of physio-chemical buffering. To-date, it remains unknown whether these habitats can actually support the metabolic function of a diverse range of corals. Similarly, whether mangroves provide the same ecological buffering service remains unclear. We examine whether reef-associated habitat sites (seagrass and mangroves) can act as potential refugia to future climate change by maintaining favorable chemical conditions (elevated pH and aragonite saturation state relative to the open-ocean), but by also assessing whether the metabolic function (photosynthesis, respiration and calcification) of important reef-building corals are sustained. We investigated three sites in the Atlantic, Indian, and Pacific Oceans and consistently observed that seagrass beds experience an overall elevation in mean pH (8.15 ± 0.01) relative to the adjacent outer-reef (8.12 ± 0.03), but with periods of high and low pH. Corals in the seagrass habitats either sustained calcification or experienced an average reduction of 17.0 ± 6.1% relative to the outer-reef. In contrast, mangrove habitats were characterized by a low mean pH (8.04 ± 0.01) and a relatively moderate pH range. Corals within mangrove-dominated habitats were thus pre-conditioned to low pH but with significant suppression to calcification (70.0 ± 7.3% reduction relative to the outer-reef). Both habitats also experienced more variable temperatures (diel range up to 2.5°C) relative to the outer-reef (diel range less than 0.7°C), which did not correspond with changes in calcification rates. Here we report, for the first time, the biological costs for corals living in reef-associated habitats and characterize the environmental services these habitats may play in potentially mitigating the local effects of future ocean acidification. The world's oceans have absorbed ca. 33–50% of atmospheric CO2 since the industrial revolution (Sabine et al., 2004), lowering global seawater pH, which is commonly referred to as ocean acidification (Gattuso et al., 1999; Hoegh-Guldberg, 2011). Global CO2 emissions are tracking above worst-case scenarios from the 5th Intergovernmental Panel on Climate Change (IPCC) report, with negative consequences predicted for coral reef ecosystems (van Hooidonk et al., 2014). Increasing sea surface temperature and the frequency of extreme temperature anomalies, combined with ocean acidification and other anthropogenic stressors threaten to cause functional collapse and a loss of reef biodiversity (Hoegh-Guldberg et al., 2007; Rodolfo-Metalpa et al., 2011; Dove et al., 2013; van Hooidonk et al., 2013, 2014). However, we currently do not know how coral biological mechanisms will be affected by increased seawater acidity, and what the cost will be of maintaining calcification under low pH. Consequently, understanding the nature and intricacies of the impacts of ocean acidification, and how it interacts with other stressors, remains a critical priority for reef scientists (Hoegh-Guldberg and Bruno, 2010; Brown et al., 2011; Wernberg et al., 2012). Coral reef climate research has to-date disproportionately focused on species-specific responses under controlled laboratory conditions (Wernberg et al., 2012). While this research has provided valuable insight into the capacity of individual taxa to tolerate stress, it often cannot account for the complex interactions that exist between all biological components of the system. For example, relationships between species cannot easily be predicted or understood where they act predominantly in a non-additive manner, due to synergistic or antagonistic relationships that can vary between response level (e.g., community vs. population), or trophic guild (e.g., autotrophs vs. heterotrophs; Crain et al., 2008). Research approaches have therefore diversified to overcome such limitations through increased emphasis on ecosystem level studies (e.g. Kleypas et al., 2011; Anthony et al., 2013), in situ experimentation (e.g., Klein et al., 2012; Okazaki et al., 2013), experimentation involving multiple climatic stressors (e.g., Anthony et al., 2011; Dove et al., 2013), experimentation across natural climate gradients (Dunne et al., 2004), as well as opportunistic experiments (e.g., temperature induced gradients from thermal outfall of a power station: Schiel et al., 2004), in an attempt to more confidently predict the future of reef community structure and function. Complementary to these various approaches has been the growing popularity of examining the nature and extent with which corals persist within environments that are considered extreme and toward their physiological limits for growth and survival (e.g., Fabricius et al., 2011; Price et al., 2012; Hume et al., 2015); specifically, broad scale latitudinal limits of coral growth (e.g., elevated temperature, Rodolfo-Metalpa et al., 2014), and reef habitats that are considered atypical (e.g., CO2 vents, Fabricius et al., 2011) or typical (mangroves, Yates et al., 2014; seagrasses, Manzello et al., 2012; reef-flat, Price et al., 2012; Andersson et al., 2013). Recent interest in coral populations within mangrove and seagrass dominated habitats is particularly intriguing since these habitats typically experience large diel variability in temperature and light conditions that would lead to bleaching-induced mortality within a classical reef setting. Importantly, they also routinely experience pH conditions (daily average and/or variance) expected for many reefs under future ocean acidification scenarios (Price et al., 2012; Guadayol et al., 2014; Yates et al., 2014). Persistence of corals within reef-associated habitats under highly variable sub-optimal growth conditions (Price et al., 2012; Yates et al., 2014) demonstrates their ability to adapt or acclimatize, and potentially tolerate wider environmental conditions. Understanding how different taxa respond is crucial in furthering our understanding of how reef habitats are likely to change in the future. Inherent biogeophysical processes of seagrass habitats significantly alter the intrinsic carbonate chemistry. Photosynthesis during daylight hours and respiration at night in the absence of photosynthesis create the characteristic diel swings in carbonate chemistry experienced in seagrass habitats, by the removal and addition of CO2 to the local seawater. Despite their diel variability seagrass habitats have been documented in the Caribbean (Manzello et al., 2012), Mediterranean (Hendriks et al., 2014), and Indo-Pacific (Anthony et al., 2013) to elevate local mean pH. Seagrass beds have therefore been described as refugia because they have the potential to maintain favorable chemical conditions (sensu Keppel and Wardell-Johnson, 2012) and potentially buffer coral populations by off-setting future decreases in seawater pH. Mangroves have similarly been proposed as potential coral refugia against climate change (Yates et al., 2014) but whether they could provide the same protective role as determined for seagrass beds remains unclear. Whilst corals clearly demonstrate some form of tolerance to survive within these highly variable habitats (Price et al., 2012; Yates et al., 2014), the physiological properties that govern tolerance remain unknown. Similarly, whether such properties scale across bioregions independently of taxa remains untested. We examine whether reef-associated habitats (seagrass, mangrove) can act as refugia to future climate change by maintaining favorable chemical conditions (elevated pH and aragonite saturation state relative to the open-ocean) but by also assessing how the metabolic functioning [Photosynthesis (P), Respiration (R), Calcification (G)] of dominant reef-building corals is sustained. Therefore, we targeted two-highly variable reef-associated habitats and an open-ocean outer-reef control habitat in the Atlantic Ocean (AO), Pacific Ocean (PO), and Indian Ocean (IO), that are subjected to minimal anthropogenic influences, to determine: (i) the extent of temporal carbonate chemistry variability [coefficient of variation (cv)] across habitats, (ii) the populations of key coral species within each bioregion site and assess indicators of their health (disease, bleaching), and (iii) the primary metabolic functioning (P, R, G) of the major coral species within each region and habitat. In doing so we provide novel data demonstrating that sites across bioregions for both seagrass beds and mangroves consistently provide important, but very different ecological services, driven by inherent differences in biogeochemical characteristics. We define for the first time the different roles reef-associated habitats of seagrass and mangroves will potentially play toward local mitigation of climate change, and clarify their potential as refugia. Three study locations situated across three bioregions (AO, PO, and IO) were investigated. At each location, an outer-reef control site subject to open-ocean seawater chemistry was compared to two reef-associated habitats, with all sites being 2–4 m in depth and situated away from any freshwater inputs. All sites experienced a tidal cycle range of 1.8 ± 0.3 m during sampling. The AO study site was located on the north coast of Little Cayman, Cayman Islands, British West Indies (3400 ha) inside the Bloody Bay Marine Park. Little Cayman is located 120 km northeast of Grand Cayman, and 10 km southwest of Cayman Brac. The outer-reef site (19°41.81, 80°04.12) was situated on the narrow coastal shelf outside of the reef terrace, which separates the lagoon from the open-ocean. The two reef-associated habitats consisted of a high seagrass biomass site (19°41.81, 80°03.77) and a transitional back-reef site (19°41.80, 80°06.06) of inter-dispersed seagrass and small patch reefs. The dominant seagrass species were Thalassia testudinum and Syringodium filiforme. The transitional site was selected to assess the continuum of carbonate chemistry changes from the outer-reef control, to the inshore seagrass lagoon in the absence of tidal flooded mangroves (Turner et al., 2013). The back-reef habitat with small patch reefs has more abiotic substrate suitable for future coral growth, making this an important assessment for future buffering potential. The outer-reef site was subject to the ocean currents around Little Cayman which move in a northwesterly direction (Stoddard, 1980; Turner et al., 2013), while the two lagoon sites experienced a western current. Sites were subject to a mix of diurnal and semi-diurnal tidal cycles. Little Cayman's benthic substrate is calcareous rock, with all sites including areas of iron-shore which is composed of white limestone, coral, and mollusk shells (Turner et al., 2013). The IO study site was located around the island of Curieuse within the Seychelles Archipelago, on the northern edge of the Mascarene Plateau, 1600 km east of Africa. Curieuse is the fifth largest granitic island within the archipelago and has an area of 286 ha, with granitic and carbonate reef systems (Hill et al., 2002). All sites were located on the south-side of Curieuse within the Curieuse Marine National Park. The outer-reef site was located on the reef flat adjacent to the fringing reef crest (04°17.08, 55°44.21). The two reef-associated systems consisted of a seagrass (dominant species: Thalassia hemprichii) dominated habitat (04°17.05, 55°44.05) and a mangrove (dominant species: Rhizophora mucronata, Lumnitzera racemose, Brugueira gymnorhiza, and Avicennia marina) dominated habitat (04°17.29, 55°43.89) located within a bay known locally as Baie La Raie. The mangrove site was not directly under the mangrove canopy (no influence from mangrove canopy shading) but in close proximity on the seaward side. All sites were subjected to a semi-diurnal tidal cycle and currents at the mangrove sites within Baie La Raie ran in an anti-clockwise direction during sampling. The PO study sites were situated around Hoga and Kaledupa islands, located in the Wakatobi, southeast Sulawesi. The Wakatobi district is located within the Coral Triangle and the Wakatobi Marine National Park was established in 1996 and became a UNESCO Biosphere reserve in 2012. The park covers 1.39 million ha making it the second largest national park in Indonesia (Tomascik et al., 1997). The outer-reef site (05°28.38, 123°43.73) was situated adjacent to the fringing reef crest on the reef flat at a site locally known as Pak Kasims, off the south coast of Hoga island. One of the reef-associated habitat sites was an adjacent inshore seagrass habitat also off the south coast of Hoga island (05°28.38, 123°43.74) which was dominated by Thalassia hemprichii. The second reef-associated habitat was immediately adjacent to the “Langeria” mangroves located off the northern coast of Kaledupa island (05°28.42, 123°43.64). This site was situated outside of the mangrove canopy (again negating the impact of canopy shading) on the seaward side, as for the IO site. The mangroves adjacent to the site were primarily Rhizophora stylosa. The carbonate reef systems here experience good water quality with minimal impact from sediment load (Bell and Smith, 2004) and light attenuation (Hennige et al., 2010). During sampling currents ran in a southeast direction but were driven by tides, with sites exposed to a semi-diurnal tidal cycle. Environmental conditions and in situ metabolic activity were measured over 5 days within a 2 week period during the annual dry seasons of each region. The mean and variance [coefficient of variation (CV)] of environmental conditions for this period did not significantly differ from values determined for a longer-term study across a full neap-spring cycle within the same season (AO, Figure S1). As expected (Albright et al., 2013), a seasonal affect (overall difference of 0.07 pH units) was identified and thus we subsequently focused on the dry season within each bioregion (AO: March 2014, IO: April 2014, PO: August 2014). During each sampling day, discrete water samples were collected at 3-h intervals starting at 7:00 h and ending at 22:00 h. From these samples, pH, total alkalinity (TA), conductivity and NO3- concentration were measured. Temperature was directly measured in situ at the time of sample collection. Light and temperature were logged at 30-s intervals over the duration of each sampling day. Temperature, conductivity and NO3- concentrations were measured using the ORION 5 Star meter (Model A329, Fisher Scientific, USA) with a pH/temperature probe (combination probe Ross Ultra; Fisher Scientific, USA), conductivity probe (ORION Duraprobe 4-Electrode Conductivity cell, Model 013005A; Fisher Scientific, USA) and NO3- probe (ORION Nitrate electrode, Model 900200). Light was measured in Lux using a HOBO Pendant Temperature/Light 64k Logger (Model UA-002-64; Microdaq, USA).Three HOBO's were used and data were averaged, providing an accuracy of ca. 3% conversion to PAR (see Long et al., 2012). Light spectrum data (see Hennige et al., 2010) from the main reef to the reef-associate habitats was compared to the spectrum data for each coefficient to determine the most appropriate constant in the conversion of PAR to Lux. Seawater carbonate chemistry was measured through direct water sampling following the Carbon Dioxide Information Analysis Centre (CDIAC) protocols (Dickson et al., 2007). pH was measured in a climate controlled lab using the Orion Ross Ultra Glass Triode Combination Electrode (Ross Ultra; Fisher Scientific, UK) calibrated with TRIS buffers (accuracy ca. ± 0.002 pH units) using the potentiometric technique and the total scale (Dickson et al., 2007). An open-cell potentiometric titration procedure was used to measure TA using the Gran method to determine the second end point of the carbonate system. TA of all samples was determined using a Titrino titrator (Model 848; Metrohm, Buckingham, UK) with an accuracy and precision of ca. ≤ 2 μmol kg−1 as verified with certified reference materials distributed by A. Dickson (Scripps Institute of Oceanography). All carbonate parameters (pCO2, TCO2 and aragonite saturation state (Ωarg)) were calculated with CO2SYS from TA and pH (Riebesell et al., 2010), and in situ temperature, salinity and sampling depth (m) as a proxy for pressure (Lewis and Wallace, 1998). For CO2SYS the dissociation constants of Mehrbach et al. (1973) were used for carbonic acid as refined by Dickson and Millero (1987), and for boric acid (Dickson, 1990). Pressure effects and orthophosphate and silicate concentrations were assumed to be negligible (Jury et al., 2010). To ensure pCO2 derived from CO2SYS was accurate in representing actual pCO2, independent samples collected throughout a 72-h period at the AO sites (triplicates at 3-h intervals, n = 72) were analyzed by a custom-built gas diffusible membrane attached to an external infrared gas analyzer (Suggett et al., 2013: r2 = 0.998, n = 72, P < 0.001). Benthic habitat assessments were conducted using continuous line intercept transects. Within each habitat, 3 × 30 m transects were randomly located with each being separated by a minimum of 50 m. Data were recorded using a high definition video-camera (Canon, G12 in underwater housing WP-DC 34) and later analyzed to quantify benthic composition to species level. One 20 m2 quadrat was established at the start of each transect to determine coral density and any visual signs of bleaching or disease. Coral growth form was determined as described by Veron (2000). In situ metabolic incubations were conducted to assess the metabolic cost for dominant coral species existing in reef-associated habitats relative to neighboring reef habitats. The metabolic function (daily-integrated G, P, and R) was determined for: AO: Dichocoenia stokesi, Porites astreoides, Porites divaricata, Siderastrea radians, Stephanocoenia intersepta. IO and PO: Acropora austera, Pocillipora damicornis, Porites lutea. IO only: Porites attenuata. Together the species examined represented the majority (55–70% AO, 56–72% IO, and 49–70% PO) of the total coral abundance within the reef-associated habitats. Acropora palmata the iconic coral species of the AO was also examined due to its critically endangered status (Aronson et al., 2008). In situ respirometry was conducted using a “Flexi-Chamber” (Camp et al., 2015). The attachment method isolated the colony from the surrounding substrata, ensuring no impact from the benthos (biological or chemical) on the metabolic signal measured. A chamber was secured around each test colony alongside three ambient seawater control chambers. Once a body of water was secured within the chamber a 100 ml syringe was used to extract the sample via an isolating valve mechanism. Water samples were kept in the dark at constant temperature (maintained at ambient seawater temperature) and transferred to the laboratory in borosilicate glass bottles for immediate analysis (always < 30-min). Initial water samples were collected and chambers left for a 3-h incubation period; end point samples were then taken. After all samples had been collected, chambers were removed from each colony, flushed with surrounding seawater, and re-secured as previously described for both test and control samples. This process was repeated at 3-h intervals for the duration of the sampling period. All incubations were run over a 24-h period, repeated five times (five different colonies per species and site) over 2 weeks. Daytime and nighttime sampling periods were necessary to obtain measurements for P, R, light-calcification (GL) and dark-calcification (GD). A 24-h sampling period began around sunrise, with 4 daytime sampling sessions completed, spaced 3-h apart. Two nighttime 3-h sampling periods were conducted. The sampling regime used allowed daytime trends in metabolic activity to be assessed, and allowed an average for nighttime measurements. All metabolic rates were normalized to the surface area of the specific coral sample. The key advantage of the Flexi-Chamber method is that stress caused by extracting corals from the environment is nullified and this rationale was a key driver for our selection of the Advanced Geometric Technique (Naumann et al., 2008) to assess coral surface area. Measurements were taken in situ (the greatest length along with the greatest width perpendicular to this length) and the surface area was calculated using the formula for the best fit geometric shape (Naumann et al., 2008). PG was calculated by the addition of PN and R.
Environmental characteristics were compared between habitats using 2-way ANOVA followed by post-hoc Tukey-Kramer. Linear regression was used to compare derived and measured pCO2 values, G to P:R, G to pH mean, G to pHCV(pH variability), and percent cover of calcifying and non-calcifying species to pHCV. Parametric test assumptions were met, with the Bartlett test used to check homogeneity of variance and qq-plots to assess normality of the data. Mixed Effects (LME) models were applied, with coral species as a random effect, to examine effect of habitat on daily net P and R. Cleveland dot-plots were used to determine outliers and boxplots and scatterplots were used to check for co-linearity within the dataset (Zuur et al., 2010). Assumptions of linearity, independence, homoscedasticity and normality were met. The model was fitted using the lme function in the nlme package in R software (R_Development_Core_Team, 2011). Model simplification was undertaken using ANOVA to compare models with progressively simplified fixed effects, thus ensuring correct P-values (Crawley, 2007). The acceptability of the model was tested by plotting the residuals against: (a) fitted values to check for homogeneity and (b) each explanatory variable in the model (including those dropped during model selection) to check for violations of independence (Zuur et al., 2007). Parameter estimation in LME models was done based on Restricted Maximum Likelihood (REML). To assess the first order influence of the metabolic activity of the benthos, local hydrography, and intrinsic differences in ocean chemistry on variability in seawater carbonate chemistry, salinity-normalized TA (nAT) to dissolved inorganic carbon (nCT) plots were generated (Suzuki and Kawahata, 2003; Kleypas et al., 2011; Yates et al., 2014). The ratio of net ecosystem calcification to net community production (NEC:NEP) were derived from these nAT-nCT plots as: 1/[(2/m)-1] (where m is the regression coefficient from the corresponding linear equation of nAT vs. nCT) (Suzuki and Kawahata, 2003; Kleypas et al., 2011). Finally, the threshold of calcification to dissolution (G-D) was determined. G-D is the level below (and/or pCO2 above) which dissolution exceeds rates of calcification, established from both models and experimentation (see Yates et al., 2014). Across bioregions and habitats there were significant differences (see Table 1 and Table S1) in carbonate chemistry (pH, TA, salinity and Ωarg) and in salinity, NO3- concentrations and temperature. Mean NO3- concentrations were slightly elevated on the outer-reef relative to the reef-associated habitats. Temperature variability (cv) was greater in the reef-associated habitats relative to the outer-reef (Table S1). Across all outer-reef sites, seawater carbon chemistry exhibited minor variability, with similar mean (±SE) pH (8.12 ± 0.03), pCO2 (323 ± 1 μatm), and TA (2372.1 ± 15.2 μmol kg SW) (Table 1). Greater variance in carbonate chemistry parameters was evident within all reef-associated habitats, with seagrass beds experiencing the greatest pHCV, with mean pH elevated (8.15 ± 0.01) and lower TA (2082.4 ± 1.1 μmol kg SW) relative to the outer-reef (pH: P < 0.0001, TA: P < 0.005). The elevation in pH and corresponding depletion in pCO2 (290 ± 7 μatm), was significant enough to elevate mean Ωarg in the seagrass above the outer-reef (4.5 ± 0.1, P < 0.01). The back-reef (AO) exhibited similar mean pH and pHCV values to the seagrass beds, however, pHCV was less extreme and mean pH was slightly reduced (8.13 ± 0.01), and was consistent with an overall reduction in seagrass biomass (reduced to intermittent patches of ca. 30% less). Mangroves experienced moderate pHCV(0.015) and lower TA (1987.7 ± 1.3 μmol kg SW). However, in contrast to seagrass beds, mangroves had a mean pH significantly lower than the outer-reef (8.04 ± 0.01, P < 0.005), which corresponded with elevated pCO2 (352 ± 6 μatm) and lower Ωarg(3.5 ± 0.1, P < 0.0005, Table 1 and Table S1). The pH diel variability of each habitat was similar independent of bioregion location (Figure S2), with all reef-associated habitats exhibiting pH peaks and troughs that correspond with maximum and minimum PAR values (r = 0.519, n = 36, P < 0.001). The tidal cycle for the PO sites corresponded with pH peaks and troughs. In the AO and IO sites, pH peaks and troughs did not correspond with the tidal cycles (Figure S2). Table 1. Bio-physiochemical characteristics of each habitat across bioregion sites. On average, the calcification-to-dissolution threshold (G-D) never fell below the Mg-calcite Ω threshold levels of 3.0–3.2 for any of the habitats (Table 1; Langdon et al., 2003; Yates and Halley, 2006; Silverman et al., 2009; Yamamoto et al., 2012). However, reef-associated habitats came close-to, or breached the carbonate-sediment G-D of 3.7. Mangroves experienced minimal variability in pCO2 and consequently Ω levels rarely (<3-h per day) fell below this threshold. However, seagrass habitats experienced diurnal variability in pCO2 (CV: 0.4 ± 0.01) which resulted in the threshold being breached, resulting in periods (up to 9-h per day within nighttime hours) when dissolution of carbonate sediment would exceed rates of calcification. Across all bioregions, the outer-reef sites showed strongest co-variability between nAT and nCT via calcification-carbonate dissolution (Figure 1). In contrast, the reef-associated habitats exhibited co-variability between nAT and nCT more strongly influenced by photosynthesis-respiration (and thus CO2uptake-release). The seagrass habitats showed the greatest range in nAT and nCT, with periods influenced significantly by photosynthesis and calcification, as well as respiration and carbonate dissolution. These characteristics are consistent with periods of extreme high and low pH, as experienced in the seagrass habitats during the day and night, respectively (Figure S2). 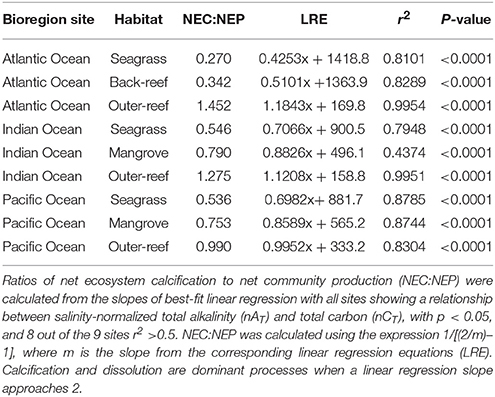 The ratio of net ecosystem calcification to net community production (NEC: NEP, Table 2) was consistently lowest for seagrass/back-reef habitats (range: 0.27–0.55), highest for the outer-reef (range: 0.99–1.45) and intermediate for the mangroves (range: 0.75–0.79). The NEC:NEP ratios are influenced by the slope of the nCT-nAT plots and consequently, the outer-reef habitats had a slope closer to a value of two than all the reef-associated habitats, which demonstrated less influence from photosynthesis and more influence from calcification. Figure 1. Salinity-normalized total alkalinity (nAT) and total carbon (nCT) plots with best-fit linear regression for three sites and habitats in the Atlantic (AO), Indian (IO), and Pacific Oceans (PO). Data is from 5 days over a 2 week period during the dry seasons for each region between 2013 and 2014. The AO site consisted of a seagrass, back-reef and outer-reef control, whilst the IO and PO sites had a seagrass, mangrove and outer-reef habitat. Black lines represent the theoretical impact of calcification (C), carbonate sediment dissolution (D), photosynthesis (P), and respiration (R) on nAT and nCT. Average nAT and nCT is indicated by a yellow dot. C and D are dominant processes when a linear regression slope approaches 2. Table 2. NEC:NEP ratios for study sites with nAT vs. nCT. Benthic surveys corroborated the nATvs. nCT analysis, where the outer-reef sites had highest cover of calcifying benthic photoautotrophs (scleractian hermatypic and ahermatypic, coralline algae and calcifying algae, 37.8 ± 1.3%, Figure 2) and thus an environment where calcification-carbonate dissolution was likely the most influential process upon carbonate chemistry. The relative abundance of calcifying benthic photoautotrophs decreased (Figure 3A, r2 = 0.864, n = 9, P < 0.001), and the relative abundance of all non-calcifying benthic photoautotrophs (seagrass, macro- and turf algae) increased (Figure 3B, r2 = 0.709, n = 9, P < 0.01), with increasing pHCV. Whilst the seagrass species Thalassia testudinum was initially included in the benthic photoautotroph category, it has been shown to be a facultative calcifier in the AO (Enríquez and Schubert, 2014). Currently there is little information on the influence of seagrass calcification to the local carbonate budget. We removed Thalassia spp. across study locations from Figure 3C to demonstrate that the trend in non-calcifying benthic photoautotrophs remains the same when Thalassia spp. are excluded (r2 = 0.529, n = 9, P < 0.01). 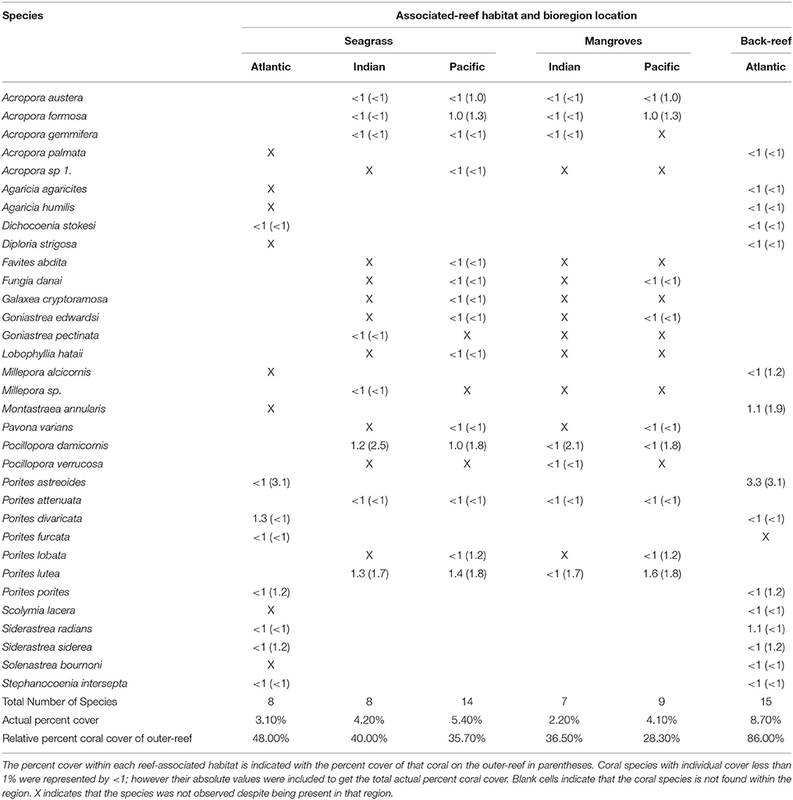 Despite low cover of calcifying benthic photoautotrophs in the reef-associated habitats (8.6 ± 0.1%, Figure 3A), a number of coral species were present (7–15 species, Table 3). Figure 2. The percentage cover of major benthic taxa at each habitat for the: Atlantic Ocean (AO), Indian Ocean (IO) and Pacific Ocean (PO) sites. Data is averaged from three by 30 m transects conducted within each habitat at each bioregion location. Surveys were conducted in the dry season of each region between 2013 and 2014. Figure 3. Plots of pH Coefficient of Variation (CV) vs. the percent cover (± standard error) of: (A) calcifying benthic photoautotrophs (scleractian hermatypic and ahermatypic, coralline algae and calcifying algae, (B) non-calcifying benthic photoautotrophs (seagrass, macro- and turf algae) and (C) non-calcifying benthic photoautotrophs excluding the Thalassia spp. of seagrass, for associated-reef habitats and an outer-reef site in the Atlantic (AO), Indian (IO), and Pacific Oceans (PO). Benthic composition data is averaged from three 30 m benthic transects. Regression is shown with 95% confidence interval (gray dashed line). Table 3. Coral species list for associated-reef habitat sites in the Atlantic, Indian, and Pacific Oceans. Coral species found within the reef-associated habitats accounted for 28–86% of coral cover on the main outer-reef (Table 3). Across regional locations the coral species found within the reef-associated habitats of the AO collectively accounted for the highest percent coral cover on the outer-reef (back-reef = 86% and seagrass = 48%). In the higher diversity regions of the IO and PO, the reef-associated habitat coral species contributed between 28 and 40% to the coral cover of the outer- reef habitats (Table 3). Coral cover in the AO (13.5 ± 0.5%) outer-reef site was ca. 60% lower than the same habitat type in the IO (34.5 ± 1.4%) and PO (32.3 ± 0.9%). Across bioregion locations, corals within the reef-associated habitat sites showed minimal (2.2 ± 0.8%) visual signs of stress (e.g., bleaching/disease/partial mortality). Calcification rates per coral species were highest at the outer-reef sites (257.0 ± 15.9 mmol m2d−1), in particular for the fast growing Acropora spp. (340.0 ± 2.9 mmol m2d−1). Here, environmental conditions were less variable than the reef-associated habitats (Table 1). Very different patterns for coral calcification were observed between the reef-associated habitats. Corals within seagrass and back-reef habitats had rates of calcification that were 12.5–33.0% lower than corals at outer-reef sites (with the exception of Acropora spp. 68.0%). Corals in mangrove-dominated habitats, exhibited even greater reductions (63.0–81.0%) in calcification rates than adjacent reef corals. In some cases, opportunistic species within seagrass habitats demonstrated an increase (1.0–3.0%) in calcification relative to the outer-reef (P. astreoides, S. radians, and P. attenuata). Maintenance of relatively high calcification in the seagrass beds and back-reef corresponded with the elevated mean pH and Ωarg for these habitats. Similarly, low calcification within mangroves is consistent with the higher pCO2 levels and reduced Ωarg. Across all sites and habitats calcification decreased with a decrease in mean pH (r2 = 0.372, n = 38, P < 0.001, Figure 4B), but to a lesser extent with increasing pHCV (r2 = 0.268, n = 38, P < 0.001, Figure 4A). This potential regulatory function of mean pH is consistent with the change of NEC:NEP across habitats (Table 2). The similarity in mean and cv of the abiotic factors (light, temperature, NO3-, see Table S1) between the reef-associated habitats suggests that differences in carbonate chemistry are significant in structuring coral biomass and growth between mangroves and seagrass systems. There were no significant relationships between calcification rates and temperature or light (mean or cv). Figure 4. Mean daily integrated net calcification for each coral species (G) (mmol m2 day−1) vs.: (A) pH Coefficient of Variation (CV) and (B) mean pH. All data plotted are mean values (n = 5), ± standard error except for pHCV (see main text) for the dominant coral species examined across associated-reef habitats (seagrass, back-reef and mangrove) and outer-reef habitat for all bioregion sites. Regression is shown with 95% confidence interval (gray dashed line). Across all bioregions, an increase in the gross photosynthesis-to-respiration ratio (P:R) corresponded with a positive increase in calcification (r2 = 0.501, n = 38, P < 0.001, Figure 5). 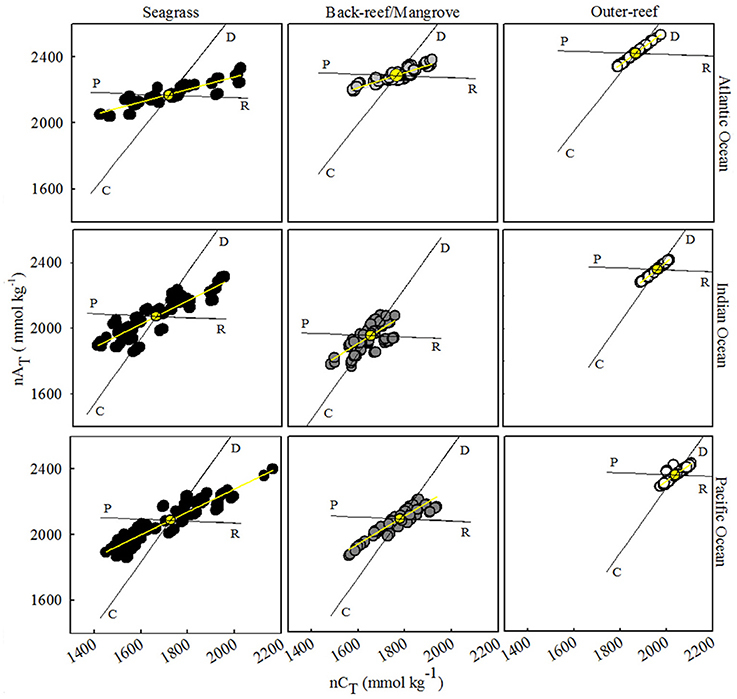 In the outer-reef, P:R remained above one, however, in the reef-associated habitats P:R decreased, largely due to a decrease in P (P < 0.05, Table S2) whilst R remained stable (within 8%). 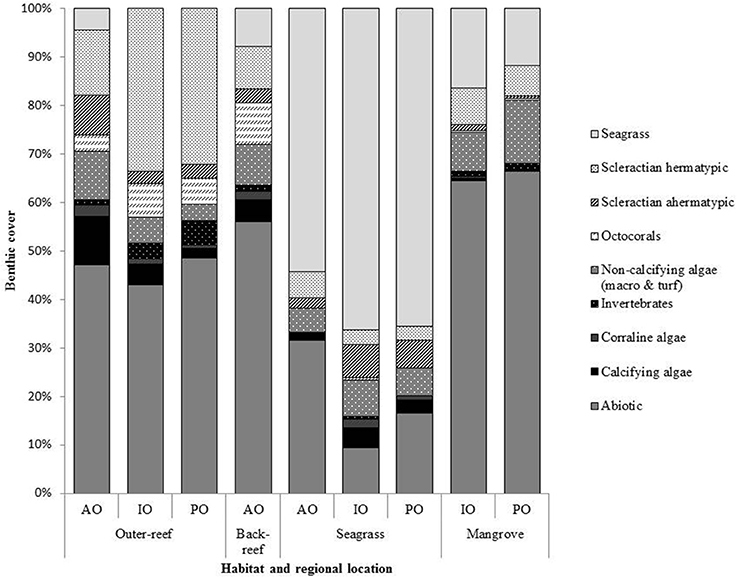 Within the reef-associated habitats massive and closed-branching species exhibited higher P:R and rates of calcification than open-branching species [F(2, 26) = 4.18, P < 0.05]. 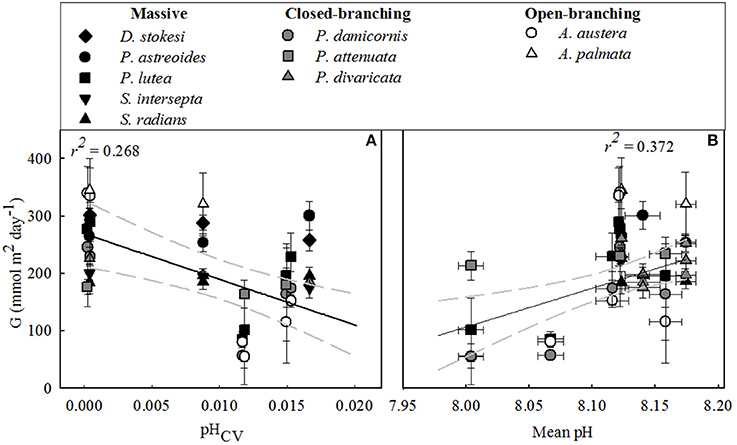 P:R was generally higher for the massive and closed-branching species as P was maintained [F(2, 26) = 4.55, P < 0.05), whereas P was drastically reduced for open-branching species (60%). Figure 5. Mean daily integrated net calcification for each coral species (G) (mmol m2 day−1) vs. the ratio of gross photosynthesis (P) to respiration (R). Regression is shown with 95% confidence interval (gray dashed line). The dotted lines denote the different habitats. Within this study we demonstrate that both seagrass and mangrove reef-associated habitats provide important ecosystem services (e.g., chemical buffering, pre-conditioned sources of corals) with respect to local climate management, but do so through different biogeochemical processes. 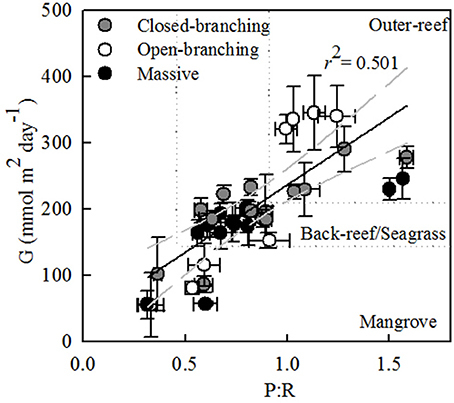 Both seagrass and mangrove habitats across bioregion sites experienced greater temperature variability than the outer-reef, thereby offering the potential for acclimatization and/or adaption to elevated temperature (Castillo and Helmuth, 2005; Jones et al., 2008; Oliver and Palumbi, 2011). The increased variability in temperature however, did not correlate with any change in calcification rates. Seagrass sites within this study consistently experienced elevated local mean pH, reduced pCO2, and therefore elevated Ωarg relative to the outer-reef. Seagrass habitats also experienced low pH at night which corresponded with periods of under-saturation of carbonate-sediment resulting in dissolution (Figure S2). Dissolution has been proposed as a self-regulatory function of marine habitats to buffer some of the negative impacts of future ocean acidification, by raising pH and TA (Anthony et al., 2011; Andersson et al., 2013). Andersson et al. (2013) demonstrated a partial offset of future ocean acidification due to dissolution by increasing pH and Ωarg by 9 and 11% respectively. The ability of seagrass habitats to buffer future ocean acidification will therefore depend in part on the fine balance of G-D over diel cycles. In the seagrass habitats, coral calcification (e.g., 140–220 mmol m2 d−1) was generally sustained supporting the hypothesis that seagrass systems may play a buffering role for resident corals from ocean acidification through biologically-mediated elevation of mean pH (Semesi et al., 2009a,b; Anthony et al., 2011; Kleypas et al., 2011; Manzello et al., 2012). In this respect, seagrass habitats may serve as coral refugia (sensu Keppel and Wardell-Johnson, 2012). However, it should be noted that Acropora spp. in the seagrass habitats did not maintain calcification rates comparable to the outer-reef, and thus the ability of seagrass habitats to act as a refugia for all coral species remains unclear. In contrast to seagrass habitats, mangrove-dominated habitats consistently experienced a lower mean pH relative to the outer-reef, which corresponded with elevated pCO2 and a reduction in Ωarg relative to both the outer-reef and seagrass habitats. Corals in mangrove habitats were metabolically challenged, evidenced by lower photosynthesis and calcification with no net change in respiration rates. Despite overall low mean pH, mangrove habitats did not experience the magnitude of diel variability experienced in seagrass habitats. Consequently, Ω levels rarely resulted in the dissolution of carbonate-sediment which would elevate TA (as evidenced in the nAT-nCT plots) and thereby self-regulate or “buffer” the local system. Failure to maintain favorable conditions, combined with the metabolic cost incurred to resident coral species, suggests that mangroves do not strictly operate as refugia as it is currently defined (sensu Keppel and Wardell-Johnson, 2012). It is therefore unlikely that mangrove habitats “buffer” resident corals from decreases in pH. More suitable descriptions of the services they are providing include: (i) pre-conditioning of local corals to future seawater conditions and/or, (ii) naturally selecting for corals that can tolerate low pH. In both cases mangrove systems seem likely to support an important genetic store of tolerant corals. The role which we propose of mangrove habitats in pre-conditioning corals to a low pH environment expands on other ecological services they may provide as put forward by Yates et al. (2014), through elevating downstream TA as a result of carbonate-sediment dissolution. Within the mangrove systems we studied, the environmental conditions that would drive carbonate-dissolution (Ω) and consequently elevate TA downstream were relatively rare (< 3-h per day, Figure S2); buffering is therefore unlikely with the climatic service of mangrove habitats better described as pre-conditioning corals to inherently low pH conditions. Fundamental to the services described for reef-associated habitats is the heterogeneity in their physiochemical environment which ensures their conditions remain out of balance with the open-ocean. Our findings support prior work which suggests that the variability in carbonate chemistry of seagrass habitats is tightly coupled with the local cover of photoautotrophs (field studies: Manzello et al., 2012; Hendriks et al., 2014; modeling: Unsworth et al., 2012; laboratory analysis: Semesi et al., 2009b; Anthony et al., 2011). Seagrasses utilize CO2 in photosynthesis during daylight hours, removing CO2 from seawater and consequently elevating pH and Ωarg (Buapet et al., 2013). At night, respiration draws down the local seawater pH in the absence of photosynthesis (Hendriks et al., 2014). Peaks of elevated pH corresponded with the time of day and average PAR further supporting the hypothesis that local phototrophic activity is the primary influence on seawater carbonate chemistry of seagrass habitats during daylight hours (see Figure S2). The magnitude of influence of seagrass species on the carbonate budget is still unresolved, with some species capable of direct carbonate production (Enríquez and Schubert, 2014). Ultimately this issue will need to be resolved through targeted investigation in order to fully understand their potential role in carbonate loss relative to photosynthetic and respiration activity, and hence their net contribution to the local carbonate system. Mangrove habitats within this study had carbonate chemistry conditions in part influenced by the local benthic composition, but they also appeared to be largely affected by other biological processes such as decomposition (Lugo, 1974; Lovelock and Ellison, 2007; Bouillion et al., 2008; Kristensen et al., 2008). The mangrove habitats demonstrated a similar daily trend in pH as observed in seagrass habitats (i.e., a relative elevation in pH during daylight hours with a reduction at night, see Figure S2), however, the magnitude of this variability was greatly reduced. The reduction in variability can be accounted for by the reduction in benthic photoautotrophs (of 80.5%). However, the large overall decrease in mean pH of mangrove habitats is still unaccounted for. It seems likely that a combination of: (i) microbial respiration processes (Kristensen et al., 2008; De Souza Rezende et al., 2013), (ii) mineralization of organic matter (Hyde and Lee, 1997; Bouillion et al., 2008), and (iii) mangrove respiration which is dominant in the root network (Lovelock et al., 2006; Huxham et al., 2010), drive down local mean pH by the release of CO2 into the water column (Shafer and Roberts, 2007). Mangroves have long been reported to impact heavily upon the local carbon balance of tropical coastal ecosystems (Borges et al., 2005); however, their exact contribution is still debated due to difficulties in tracing carbon within this system (Bouillion et al., 2008). Results from this study highlight the need for further investigation into their role in the local carbon cycle. Coral metabolic responses across both reef-associated habitats were characterized by reductions in photosynthesis and calcification without a change in respiration. Such a pattern is broadly consistent with the experimental work of Anthony et al. (2008) on Acropora and Porites spp. exposed to future IPCC IV and VI scenarios. An increase in light availability has been shown to enhance calcification (e.g., Suggett et al., 2013) and a moderate rise in temperature has also been documented to increase metabolic rates in corals, which potentially enhances growth (Bessat and Buigues, 2001; McNeil et al., 2004). Unsurprisingly there were no significant relationships observed between calcification and temperature or light in our study due to the similarity in mean conditions at all habitats (Table 1). Increased heterotrophy (Cohen and Holcomb, 2009) and the addition of nutrients (Langdon and Atkinson, 2005) have also been suggested to enhance calcification for some coral species (Cohen and Holcomb, 2009). NO3- concentrations were higher in the outer-reef control sites, but differences in calcification rates observed in non-reef habitats are not explained by variability in NO3- concentrations (Table S1). It is possible that other nutrients may influence coral metabolic activity within associated-reef habitats (Langdon and Atkinson, 2005). Collectively however our results suggest that photosynthesis and calcification were most likely impaired by the metabolic costs of maintaining cellular homeostasis within a low pH environment (Anthony et al., 2008; McCulloch et al., 2012). This hypothesis is further supported by our observations that Acropora spp. experienced the largest decrease in calcification whilst Porites spp. were better able to maintain calcification across environments; by modeling internal pH regulation McCulloch et al. (2012) also concluded that the calcification rates of Acropora spp. would be most sensitive to reductions in external pH and Porites spp. the least. Further research is necessary to confirm the interpretation of our results, but it is evident from our study that species-specific responses exist. Our cross-bioregion dataset significantly expands upon recent localized reports that a relatively large range of coral taxa can persist in associated-reef habitats (Price et al., 2012; Yates et al., 2014). A range of coral species were recorded and were not restricted to encrusting or massive forms (Fabricius et al., 2011; Yates et al., 2014) but also included species of architecturally complex genera such as Acropora and Pocillipora, that have demonstrated varied responses to environmental extremes (Marshall and Baird, 2000; Hughes et al., 2003; Baker et al., 2004). The corals documented in associated-reef habitats had different life-history strategies; for example, corals fell into three of the four life history categories established by Darling et al. (2012) (competitive, weedy and stress-tolerant). Whilst the total number of coral species recorded in associated-reef habitats was similar across regions, these total values represented very different proportions of the overall number of coral species found within each bioregion location. For example, corals found in the associated-reef habitats of the AO represented ca. 20–30% of the total number of coral species currently documented in the Atlantic region. However, in the IO and PO sites, corals recorded in the associated-reef habitats only represented 1–2% of species found in the Indo-Pacific region. Whether the high proportion of total species of the AO that are found within associated-reef habitats reflects the bioregions overall reduced species pool, past environmental histories, present-day ecological and/or environmental pressures, or is a feature of regionally-specific evolutionary relationships remains unclear. Clearly, further examining the physiology of corals in these environmentally more extreme and variable habitats can inform our understanding of the potential for individual coral taxa to persist under future environmental change. A large range of physiological responses have been documented for corals exposed to low and more variable pH (Ries et al., 2009), which can be explained by the ability of coral species to: (i) modify H+ concentrations within the calicoblastic fluid (Jokiel, 2013), (ii) utilize different inorganic carbon species (Furla et al., 2000; Comeau et al., 2012), and/or (iii) the response of additional and multiple interactive stressors interacting with the pH effect (e.g., pH and temperature, Anthony et al., 2008). Whether coral species are adapted or acclimatized to the environmental conditions of associated-reef habitats remains unresolved. Importantly, work by Bongaerts et al. (2010) found that corals and their symbionts were highly structured and genetically similar for analogous habitats within a reef, however, genetically isolated between different habitats. Whether these findings translate across bioregions and other reef habitats also remains unknown. Results from this study demonstrate why it is important to consider the actual amount of time a coral is exposed to a set of environmental conditions within any habitat. In this instance characterizing the variability (CV) as well as the mean in pH is important for understanding the buffering capacity of associated-reef habitats and therefore in evaluating their role as potential refugia (Guadayol et al., 2014). Environmental variability has been proposed to enhance species resilience by increasing the range of conditions individuals are regularly exposed to, making them potentially better able to cope with environmental anomalies (Guadayol et al., 2014). Corals have been documented to acclimatize to thermal stress via prior exposure to temperature variability (Castillo and Helmuth, 2005; Jones et al., 2008; Oliver and Palumbi, 2011). Similarly, coral recruits grown under natural-pCO2 oscillations have shown higher growth and survivorship compared to those exposed to more stable conditions (Dufault et al., 2012). Adult corals (Acropora hyacinthus) have documented a similar increase in growth (ca. 21%) under oscillating CO2 rather than continuously elevated CO2(Comeau et al., 2014). The importance of natural variability and environmental history in pre-conditioning corals to future stress remains debated and may depend on the local setting (Crook et al., 2012). Okazaki et al. (2013) for example, reports that stress tolerant corals of Florida Bay were equally sensitive to future ocean acidification, despite frequent exposure to pCO2 and temperature variability. In this case it appears that a species may have a maximum acclamatory ability that is not influenced by its environmental history. Rodolfo-Metalpa et al. (2014) recently demonstrated in the Mediterranean that the same species of coral from environments with a >3°C difference in ambient temperature regimes had similar abilities to tolerate future warming. Clearly the mechanisms that potentially govern acclimatization and/or adaption are unresolved as is the influence of environmental histories on stress physiology. Our data significantly expands on the growing evidence that at low mean pH, as experienced in mangrove-dominated habitats, coral calcification is suppressed. Crook et al. (2013) demonstrated a 40% reduction in calcification of Porites astreoides exposed to life-time low pH. If low pH conditions become the norm within classical reef settings, corals and their hard carbonate foundation could be jeopardized, threatening the functional role of reef building corals as the ecosystem architects that support system biodiversity and productivity (Dove et al., 2013). However, clear species-specific responses exist to low pH and increasingly studies are demonstrating the ability of corals to maintain or even increase calcification rates under acidified conditions; highlighting the complex intricacies that exist and need to be better understood to comprehend the response of coral reefs to future climate change (e.g., Crook et al., 2012; Comeau et al., 2013, 2014). Our results suggest that coral reefs are not isolated systems; they are often connected to adjacent habitats that may buffer against low pH or provide a source of pre-conditioned corals that are able to sustain growth under low pH conditions. The environmental heterogeneity of both seagrass and mangrove systems is essential in maintaining different biogeochemical conditions that underpin the ecosystem services described (Anthony et al., 2013; Yates et al., 2014). Further efforts are needed to explore associated-reef habitats to assess whether the roles described for seagrass and mangroves habitats explored within this study apply more broadly. Further quantification is also needed to determine how mangrove biomass and its proximity to corals influence the local carbonate chemistry, along with the role minority species located within reef-associated habitats have on the local carbonate chemistry. Importantly, the ability of associated-reef habitats to potentially drive acclimatization or promote adaption to suboptimal temperature and pH clearly further enhances their conservation status and their potential importance in the local mitigation of climate change stress. That said, caution must be taken not to extrapolate the findings of this study as a “cure and/or solution” to the problem of ocean acidification; without question priority actions must be focused on reducing emissions (van Hooidonk et al., 2014). Our novel results contribute significantly to the efforts identifying options to manage or mitigate against the possible impacts of climate change stressors on one of the world's most important ecosystems (Salm et al., 2006; Yates et al., 2014). EC, DJSu and DJSm designed the study (CM contributed to Atlantic site design), EC, DJSu, and DJSm collected the data, EC and DJSu analyzed the data, EC, DJSu, and DJSm led the writing of the manuscript, with all authors commenting on and approving the final draft. The authors are grateful for financial and logistical support within Indonesia from Operation Wallacea, The Wallacea Biodiversity Institute, Balai Taman Nasional Wakatobi (Wakatobi National Park), The Wakatobi Government, Ministry for Research, Technology, and Higher Education, Indonesia (RISTEK-DIKTI); within the Seychelles from the Mitsubishi Corporation, The Earthwatch Institute and the Seychelles National Parks Authority (GG) and within the Cayman Islands from the Central Caribbean Marine Institute (contribution # 4:2016) with funding to EC supported as the CCMI Coral Reef Fellow and to CM within the Cayman Islands by the Royal Caribbean International Ocean Fund, the Guy Harvey Ocean Foundation, and the Dart Foundation. Research in the Cayman Islands was permitted by the Marine Conservation Board for the CCMI Caribbean Climate Change and Coral Reef Stress Program. Research within Indonesia was permitted through a RISTEK research permit granted to DJSm in collaboration with JJ. The contribution of DJSu was additionally supported through an ARC Future Fellowship (FT130100202). Crawley, M. (2007). The R Book. Chirchester: John Wiley & Sons, Ltd.
Dickson, A. G., Sabine, C. L., Dickson, A. G., Sabine, C. L., and Christian, J. R. (2007). Guide to Best Practices for Ocean CO2 Measurements. PICES special publication 3, IOCCP report No.8. Furla, P. A., Galgani, I., Durand, I. S., and Allemand, D. E. (2000). Sources and mechanisms of inorganic carbon transport for coral calcification and photosynthesis. J. Exp. Biol. 15, 3445–3457. Hyde, K. D., and Lee, Y. (1997). Ecology of mangrove fungi and their role in nutrient cycling: what gaps occur in our knowledge? Hydrobiologia 295, 107–118. Lewis, E., and Wallace, D. W. R. (1998). Program Developed for CO2 System Calculations. ORNL/CDIAC-105. Oak Ridge: Carbon Dioxide Information Analysis Center, Oak Ridge National Laboratory, US Department of Energy. Lovelock, C. E., and Ellison, J. (2007). “Vulnerability of mangrove and tidal wetlands of the Great Barrier Reef to climate change,” in Climate Change and the Great Barrier Reef: A Vulnerability Assessment, eds J. E. Johnson and P. A. Marshall (Townsville, QLD: Gt. Barrier Reef Marine Park Authority), 237–269. Tomascik, T., Mah, A. J., Nontji, A., and Moosa, M. K. (1997). The Ecology of the Indonesian Seas: Part, I. I. Vol VIII. Singapore: Periplus Editions (HK) Ltd.
Turner, J. R., McCoy, C., Cottam, M., Olynik, J., Timothy, A., Bluementhal, J., et al. (2013). “Biology and ecology of the coral reefs of the Cayman Islands,” in Coral Reefs of the United Kingdom Overseas Territories, Coral Reefs of the World, Vol. 4, ed C. R. C. Sheppard (Springer), 69–88. Veron, J. E. N. (2000). Corals of the World, Vol. 1–3. Townsville: Australian Institute of Marine Science. Zuur, A., Leno, E. N., and Smith, G. (2007). Analyzing Ecological Data. New York, NY: Springer. Copyright © 2016 Camp, Suggett, Gendron, Jompa, Manfrino and Smith. This is an open-access article distributed under the terms of the Creative Commons Attribution License (CC BY). The use, distribution or reproduction in other forums is permitted, provided the original author(s) or licensor are credited and that the original publication in this journal is cited, in accordance with accepted academic practice. No use, distribution or reproduction is permitted which does not comply with these terms.